Steven Levy: Let me ask an unrelated question about the raging debate over whether artificial intelligence poses a threat to society, or even the survival of humanity. Where do you stand? 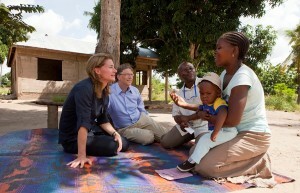 Bill Gates: I think it’s definitely important to worry about. There are two AI threats that are worth distinguishing. One is that AI does enough labor substitution fast enough to change work policies, or [affect] the creation of new jobs that humans are uniquely adapted to — the jobs that give you a sense of purpose and worth. We haven’t run into that yet. I don’t think it’s a dramatic problem in the next ten years but if you take the next 20 to 30 it could be. Then there’s the longer-term problem of so-called strong AI, where it controls resources, so its goals are somehow conflicting with the goals of human systems. Both of those things are very worthy of study and time. I am certainly not in the camp that believes we ought to stop things or slow things down because of that. But you can definitely put me more in the Elon Musk, Bill Joy camp than, let’s say, the Google camp on that one.